The rich bird life of North Iceland, distributed over widely varying habitats, displays a diversity seldom surpassed in Iceland and accessible areas for seeing species such as the Barrow’s Goldeneye, Harlequin Duck, Gyr Falcon, Rock Ptarmigan, the Great Northern Gannet and the Guillemot. Wetlands are important as a habitat for many Icelandic breeding species, and of the Icelandic wetlands which are famed for rich bird life, several of the most renowned are in North Iceland. Click for more information. This website is not hosted by the Birding Iceland Community. 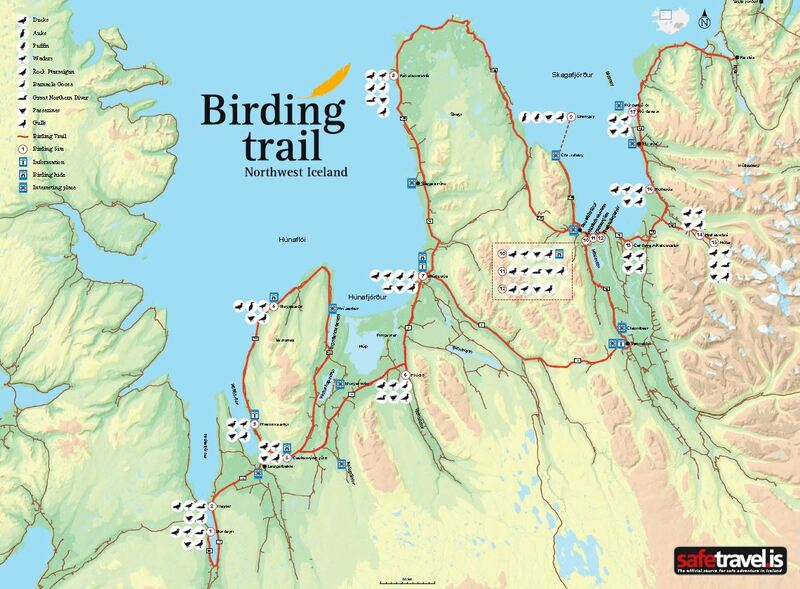 This website only contains information about the 3 birding trails of North Iceland and information about travelling around the area. For information about the Icelandic Birding Community please visit www.facebook.com/birdingiceland. another, travellers can join and leave the trail whereever they want. still wanting to see rich birdlife. What to Expect in Iceland? 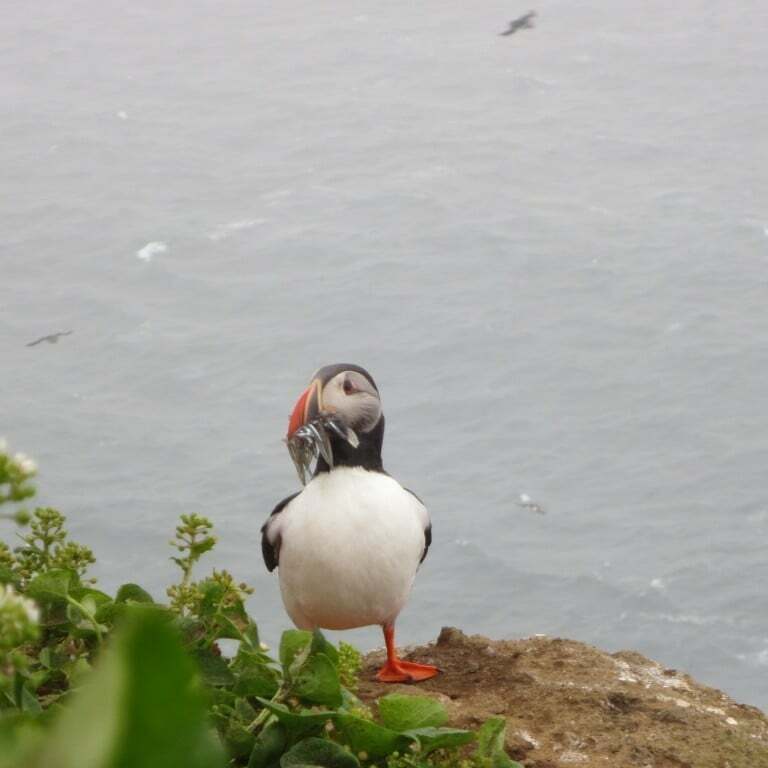 Atlantic Puffin, Fulmars and other sea and cliff birds. we recommend The Icelandic Bird Guide. bird watch whenever you desire. Redpoll, gulls, ducks and a few others. go to Explore Data - Bar Chart - Iceland. Puffin, Kittiwake and many other species live close to the ocean. as the Red-necked Phalarope, Golden Plover or Snipe. recommend tour operators operating both locally and across Iceland. The Eyjafjörður region is densely populated by Icelandic standards, constituting the centre of the north, as Reykjavík is in the south. 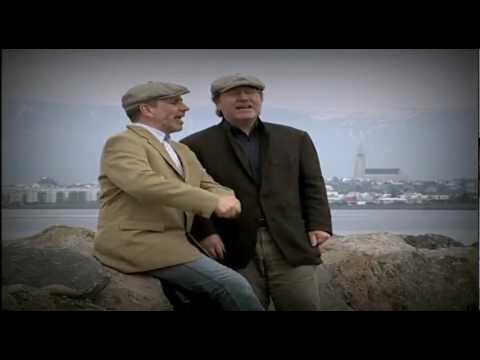 The largest community in the region is Akureyri (pop. just over 18,000), which is about 5 hours by road from Reykjavík. Buses run every day, and flights between Reykjavík and Akureyri (about 6 times a day) take 35 minutes. Official brochure at the bottom of the page. And here you can download the brochure. The nature of Eyjafjörður makes for a good environment for both humans and birds. Extensive wetlands, rivers, marshes and fertile deltas provide a favourable habitat for vegetation and small creatures, which in turn attract migratory birds in their thousands. Iceland’s global position between temperate and polar zones leads to great biological diversity among small organisms in the ocean north of the island – which are a food source for animals and birds further up the food chain. 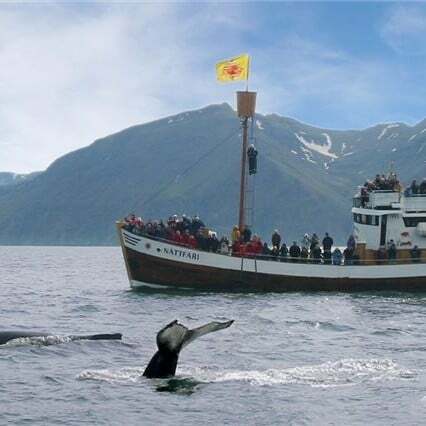 Eyjafjörður has many fishing villages, and whale-watching cruises operate from a number of places around the fjord. Eyjafjörður is one of the best areas in Iceland for birdwatching. The Eyjafjarðará, Hörgá and Svarfaðardalsá river estuaries are among the places in Iceland with the greatest variety of bird species. The northernmost place in the country, Grímsey island on the Arctic Circle, has one of Iceland’s most spectacular bird cliffs, with a huge Puffin colony and the second-largest Razorbill colony in the country (the largest is Látrabjarg in the West Fjords). Eyjafjörður offers a range of organized birdwatching locations, with picnic places, information signs for visitors, marked footpaths and hides for birdwatchers. 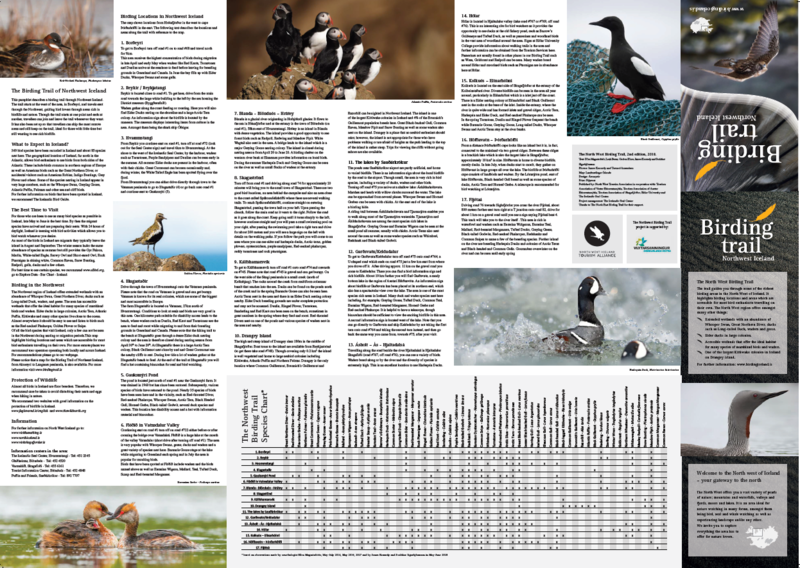 This booklet provides information on 11 birdwatching locations in Eyjafjörður. Birds can, of course, be seen everywhere in the region, but these sites provide favourable conditions, easy access, and services – at the minimum parking, footpaths, information signs about the area and/or hides. 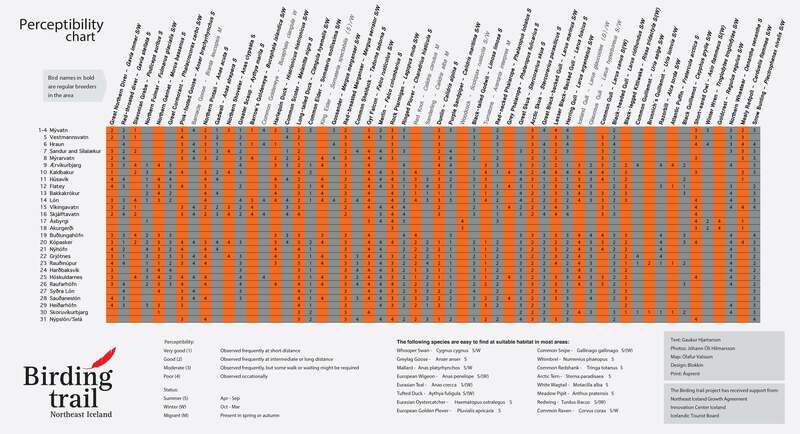 At the back of the booklet is a table showing which species of birds can be seen in each area. Grímsey island is the northernmost place in Iceland, 41 km north of the mainland. 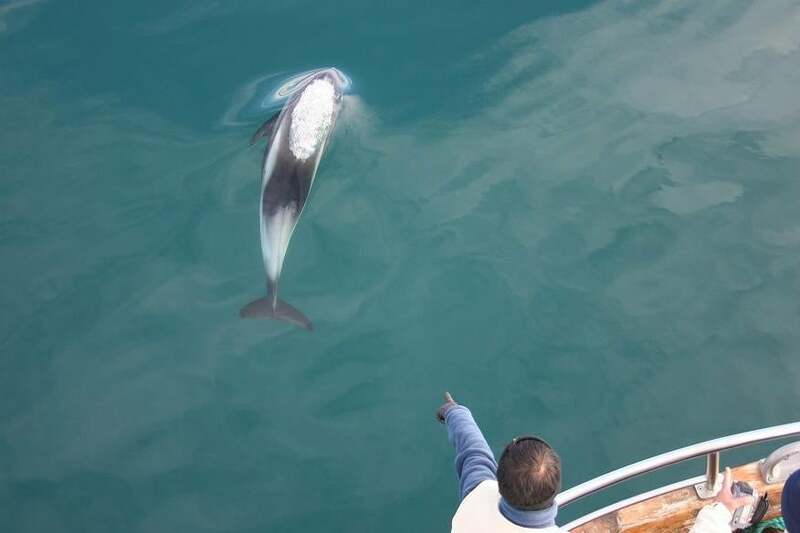 It is served by a ferry (3hrs) from Dalvík on Mondays, Wednesdays and Fridays, and scheduled flights (25min) from Akureyri daily in summer, and three days a week at other seasons. Grímsey is about 5.3 km² in area. The island has several marked footpaths. We recommend setting off northwards towards the end of the island. The path crosses the Arctic Circle, and on the island you can get a certificate to prove you have been there. A footpath follows the cliff edge around to the Grenivík lighthouse at the southern end of the island. On the way back via the western shore, notice the spectacular formations of columnar basalt projecting into the sea. The route offers a number of excellent locations for bird photography. A large number of Iceland’s bird species are found on the island – as it offers plentiful sources of food for them. Birdlife on Grímsey also benefits from the absence of both rats and foxes. Grímsey is one of the best places on Iceland’s coast to watch cliff-nesting birds. 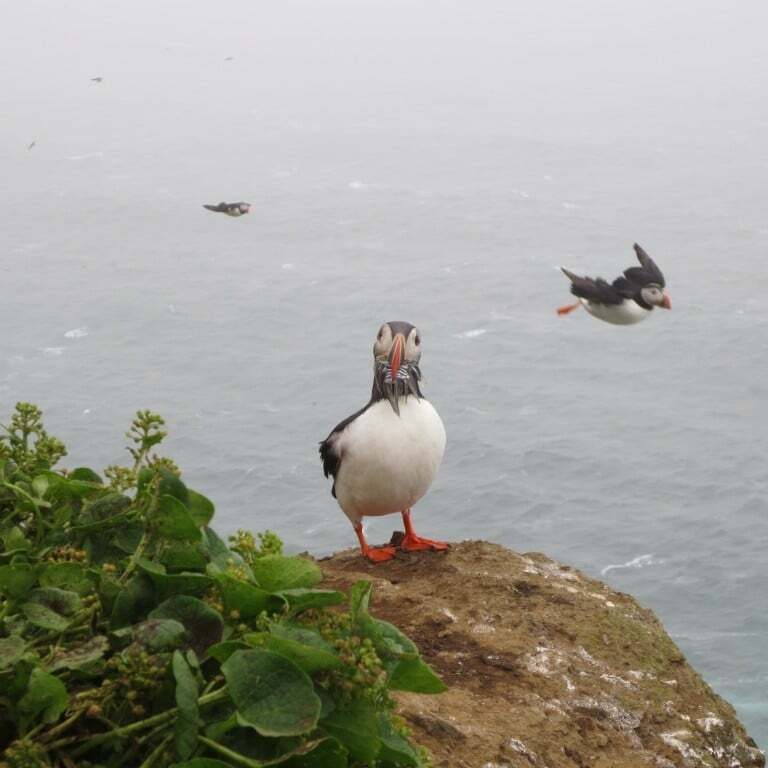 These seabirds generally arrive in March for the breeding season and depart by August. Icelanders traditionally went “climming,” descending birdcliffs on ropes to gather eggs, and this practice continues on Grímsey. In the scree beneath the cliffs is one of Iceland’s biggest Razorbill colonies. Grímsey also boasts the largest Puffin colony on the north coast of Iceland. 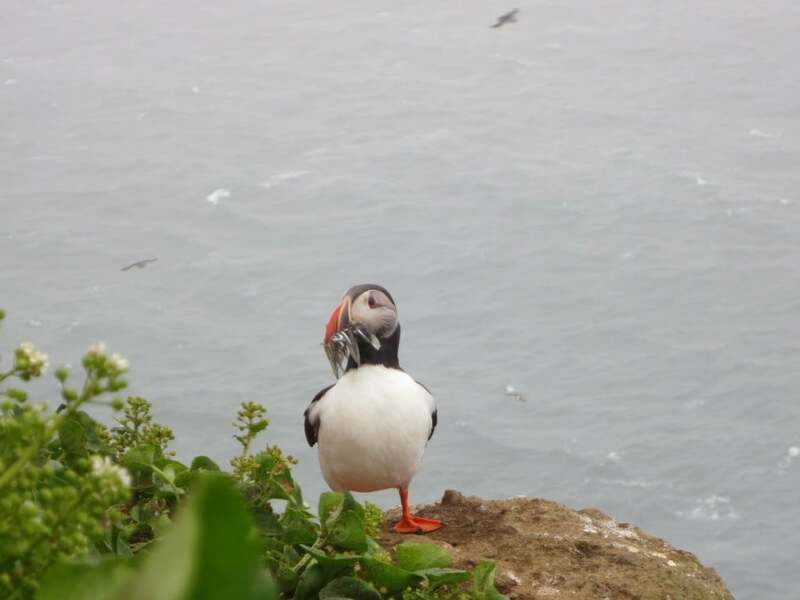 The Puffin stays on the island from late April until early August, and is easily approachable. Grímsey also has one of Iceland’s largest and densest Arctic Tern colonies. Siglufjörður is surrounded by high mountains, with little lowland between the mountains and the sea. Man lives there in close community with nature, and a diverse range of birdlife is within easy reach of the village. At the head of the fjord, inland from the harbour, extensive mudflats have formed where the Hólsá river flows out into the sea, creating ideal conditions for waders and coastal birds. By the road at the west side of the fjord is an information sign about the main bird species in the area. The best way to watch birds is to walk along the gravel track on the east side of the fjord, or the old disused runway nearby – which stretches about a km along the head of the fjord on the east side, from the Hólsá estuary. Parking is available at the churchyard a little farther up (by road no. 76). Along by the old runway is a more-or-less continuous colony of Arctic Terns and Eiders. In addition most of the common species of coastal and heathland birds may be seen, especially in spring and early summer. Ólafsfjörður is surrounded by mountains that slope steeply down to the sea. At the head of the fjord is a broad grassy valley with Ólafsfjarðarvatn (Ólafsfjörður Lake). The natural environment is characterized by a special interplay of land and sea. Ólafsfjörður Lake is an unusual natural phenomenon, as at high tide seawater flows into the lake. As the specific gravity of salt water is greater than that of fresh water, the bottom of the lake is salty while the upper layers are fresh water. The fish species in the lake thus include both saltwater fish such as Cod, Herring and Plaice and freshwater species such as Trout and Arctic Char. During the summer (May-September) a hide is located at Þóroddsstaðatjörn (Þóroddsstaðir Pond) at the end of Ólafsfjörður Lake, about 4.5 km inland from the village. A gravel road (no. 802) leads along the western side of the lake, where the hide is about 30 m from the road. There is no car park as such, but visitors can park at the side of the road. Birdlife abounds around Ólafsfjörður Lake: seabirds and gulls at the seaward end, and ducks and waders in the surrounding wetlands. 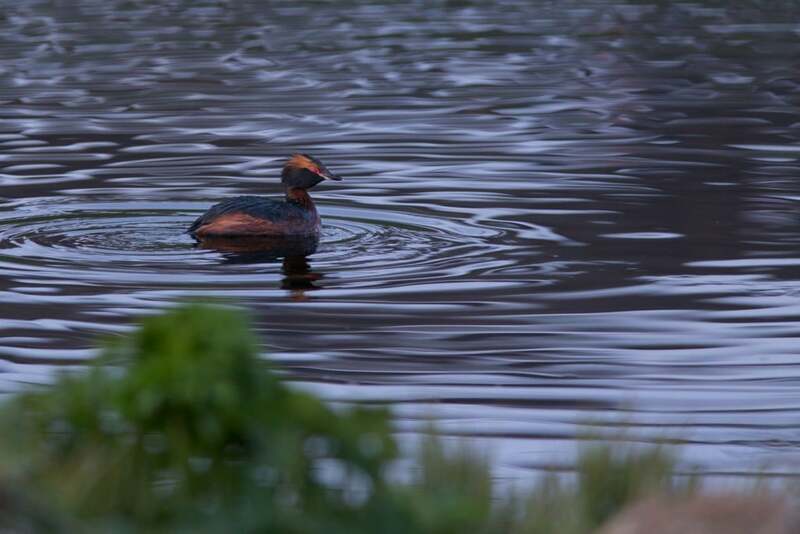 Slavonian Grebes nest close to the village, and the Great Northern Diver is seen every year on the lake. 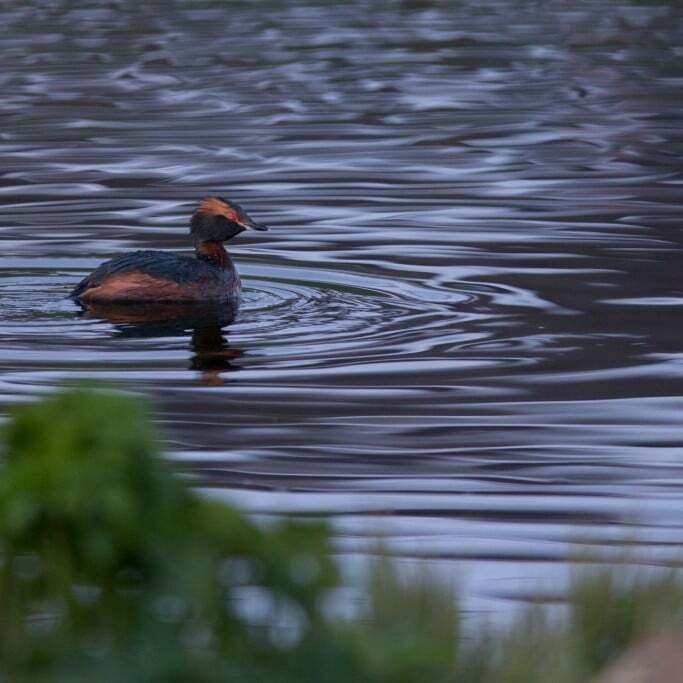 On good days in spring and summer, Þóroddsstaðir Pond offers the opportunity to see a wide variety of waterfowl, waders and passerine species; the Red-throated Diver also nests nearby. Svarfaðardalur is verdant and surrounded by high mountains. The lower part of the valley has extensive wetlands which abound in birdlife: the Svarfaðardalur Nature Reserve, the first wetland area granted protection in Iceland extends over an area of 8 km². Here the birdwatcher can easily observe an unusually large variety of bird species in a small area – mainly waterfowl and waders, but also passerines and gulls. Around 30-40 bird species breed in the Nature Reserve, and others pass through. The lower birdwatching area close to Dalvík comprises wetland from the sea and along the Svarfaðardalsá river below road 82. The area of the Hrísahöfði headland and Hrísatjörn pond abounds in birdlife, and provides good conditions for birdwatchers. An entrance sign is located at the Olís petrol station at Dalvík, where parking is also available. A footpath leads along the Svarfaðardalsá river, crossing a bridge at Árgerði to Hrísahöfði, and along the banks of Hrísatjörn. Along the path are information signs about vegetation and birdlife, as well as geology and historical sites. From the Árgerði bridge it is also possible to follow a marked walking route along the river to Húsabakki, 4.5 km away. The Great Northern Diver is seen every year on the pond, and the Red-throated Diver nests nearby and can often be spotted on the river from the road. The Slavonian Grebe is also noticeable, and the Whooper Swan breeds here every year. The Black-headed Gull nests densely by Dalvík, and the Common Gull population is rising. At the east of Hrísatjörn is a hide. 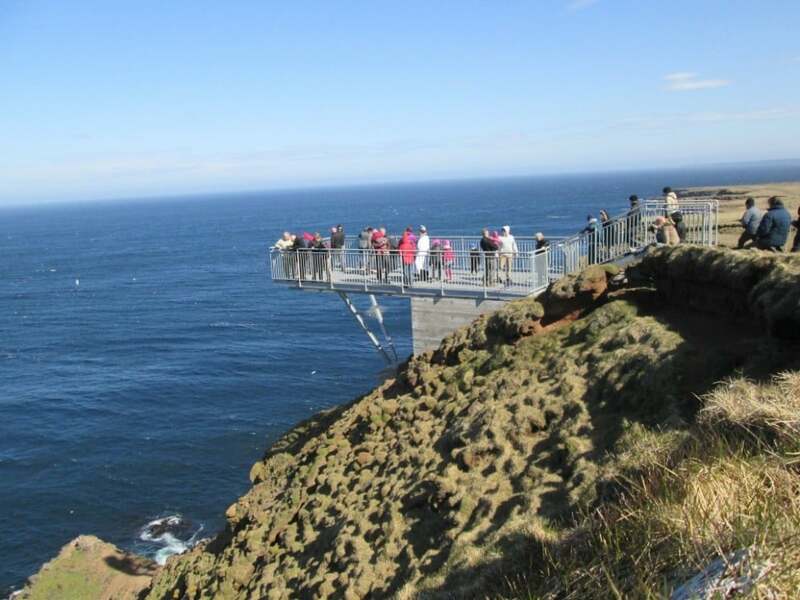 The birdwatching area at Húsabakki is at the inland end of the Svarfaðardalur Nature Reserve, about 5 km from Dalvík (Svarfaðardalsvegur no. 805). This includes wetland and meadow/scrub by Tjarnartjörn (Tjörn Pond) and along the banks of the Svarfaðardalsá. Húsabakki, formerly a school, is now a community centre and hotel. At Húsabakki is an entrance sign for the Nature Reserve, and parking facilities. A marked walking route with information signs leads past the hide at Tjarnartjörn down to the river. The path then follows the riverbank through scrub and marshland back to Húsabakki. From the path a wide variety of waterfowl and waders may be seen; also Ptarmigan and passerines. Black-tailed Godwit, Whimbrel and Greylag Geese are abundant, and Harlequin Ducks are often seen on fast-flowing reaches of the river. Hrísey island, sometimes called “the Perl of Eyjafjörður,” is the second-largest island off Iceland’s coast, with an area of 7.4 km². From Árskógssandur (road no. 808) a ferry sails to the island every two hours daily. The crossing takes 15 minutes. Three clearly-marked circular routes of 2.3, 4.5 and 5 km lie through the village and the southern part of the island, where the birdlife is most diverse. Along the paths are information signs about vegetation, birdlife and other items of interest. At Lambhagatjörn (Lambhagi Pond), north of the village and less than a km from the harbour, is a hide. Nearly 40 bird species breed on the island, and are densely spaced during the nesting season. The Ptarmigan has a special place among the island’s birds, and features on the community’s official crest. 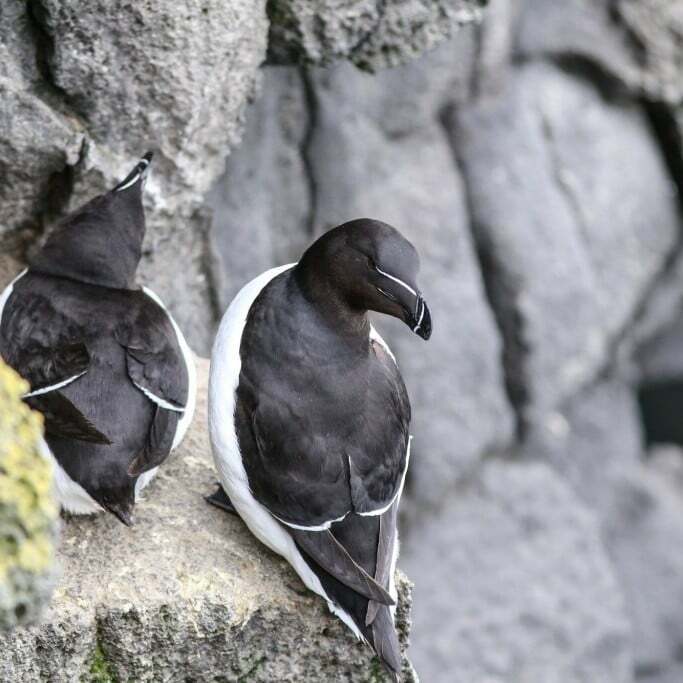 It is a protected species on Hrísey, although it is hunted elsewhere in the country; research has been carried out on the birds for many years. 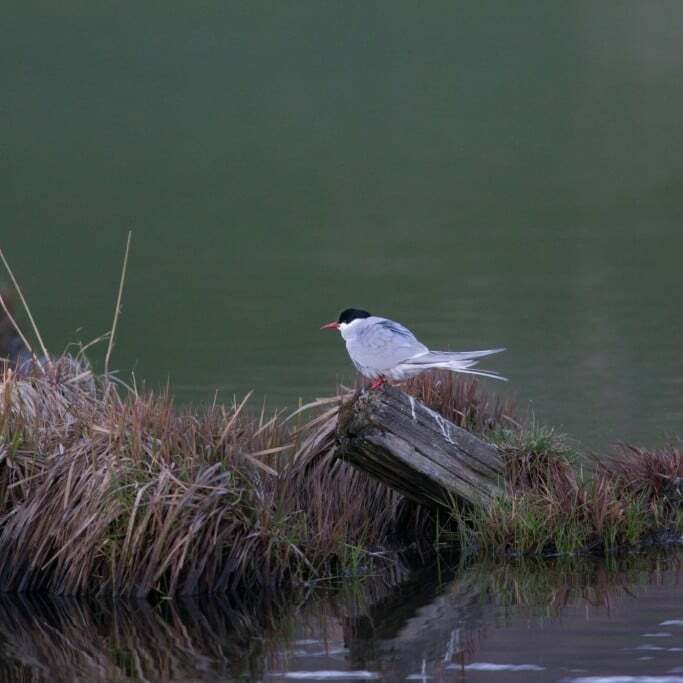 Many Arctic Terns nest on Hrísey, and waders also form dense breeding colonies. The birds benefit from the absence of any wild predators on the island. One of Iceland’s largest colonies of Common Gull is on Hrísey. At the north of the island is an Eider colony which is protected and utilised by the landowners. Access is by permission only. Krossanesborgir is a nature reserve just north of Akureyri, about 1 km² in area. Moulded by glacial action during the Ice Age, the area is characterised by low rounded rocks with glacial striations, known as whalebacks, interspersed with marshland. Parking is available at the south of the area, which is reached from Óðinsnes (street name). An entrance sign provides information on birds, vegetation and walking routes. Gravel footpaths lead from the car park through the rock formation, providing options for routes of different lengths. Along the paths are signs providing information about history, geology, vegetation and birdlife. At Djáknatjörn pond, in the north of Krossanesborgir, about 1.3 km from the car park, is a hide. About 30 bird species breed in the area, totalling 5-600 pairs. These include a big gull colony and a large number of Ptarmigan. In addition many species of waders, waterfowl and passerines breed here. Naustaborgir is a cluster of tall rocky formations north of the campsite at Hamrar. To the west is grassy marshland, and the Hundatjörn pond, which was drained in the 1940s, but reclaimed in 2007 by damming. A path about 3 km long leads through the area from the Naustahverfi district of Akureyri, south of the Jaðar golf course. At the end of Ljómatún (street name) parking is available. A hide is located about 1 km from there. 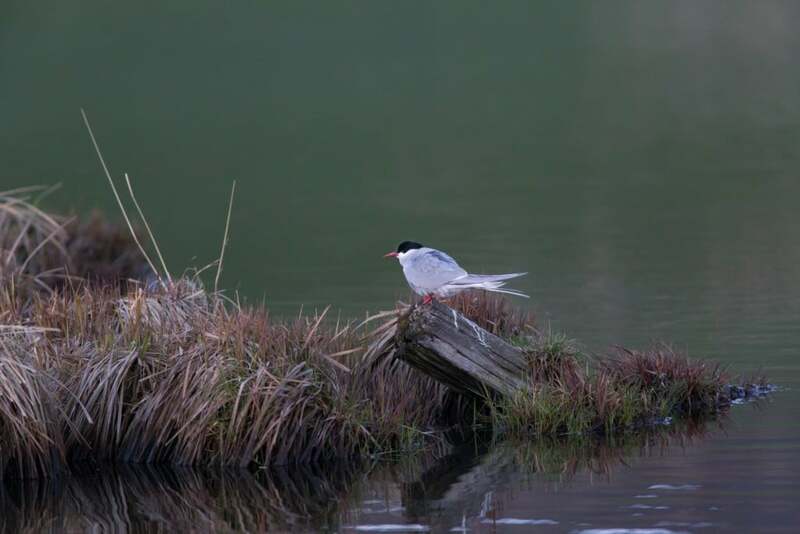 Waders, Black-headed Gulls and ducks nest at Hundatjörn, while passerines nest in the varied woodland around it, including such species as Redwing, Redpoll, Wren and Goldcrest – a recent arrival and the smallest Icelandic bird. Deltas are relatively few in Iceland, and almost all are in the north. The largest is the Eyjafjarðará river delta. The area forms the low point of 20 km of lowland along the river banks, formed by fluvial sedimentation since the end of the Ice Age. The lowest part of the area comprises extensive mudflats which are exposed at low tide, providing a feast for numerous bird species. The Ring Road (no. 1) crosses Eyjafjörður at the mudflats (Leiran). While the delta and mudflats have suffered encroachment by transport infrastructure in recent years (such as airport and road construction), they remain one of Iceland’s most important habitats for thousands of wetland birds which migrate there every year. The old road across the delta, now closed to motor traffic, is a popular route with joggers and walkers. An entrance sign is located on Eyjafjarðarbraut vestri (no. 821) at the south of the airport. From there it is possible to walk to a hide at Stóri-Eyrarlandshólmi (2.5 km), or cross the three old bridges over the Eyjafjarðará river (3.5 km) to Eyjafjarðarbraut eystri (no. 829) on the eastern side of the fjord. The Leiruvegur road (no. 1) and Eyjafjarðarbraut eystri (no. 829) provide good views over the Leiran mudflats. Cars can be parked in lay-bys along Eyjafjarðarbraut eystri (no. 829). 30-40 bird species breed in the area, and others pass through. The Black-headed Gull and Eider are the commonest species, followed by the Arctic Tern, Greylag Goose, and various waders and ducks. Kristnestjörn (Kristnes Pond) lies just below the farmstead of Kristnes by Eyjafjarðarbraut vestri (no. 821). The pond has abundant vegetation and around it is sedge-marsh, providing an ideal habitat for waterfowl. Above the pond and marsh is a hide, a 500m walk along the old road from the southern end of Kristnesvegur (no. 822). A pair of Whooper Swans nest at the pond, where the Slavonian Grebe may also be seen, along with a variety of ducks and waders. In April-May large numbers of Wigeon call here, 100-300 birds. Svalbarðseyri is a small fishing village on the east of Eyjafjörður about 15 km from Akureyri. Turn off the Ring Road (no.1) onto the Svalbarðseyri road (no. 830), and drive down to the lighthouse at the top of the beach. At the shore are two ponds, which are surrounded by abundant birdlife – especial the more northerly, Tungutjörn, which has more vegetation. At the ponds on the shore of the mudflats south of Tungutjörn all the main species of Icelandic waders may be seen, along with gulls, Slavonian Grebe, Eider, Long-tailed Duck and other ducks. Various passage migrants are also seen here in May-June, such as the Turnstone and Knot, on their way to more northerly breeding grounds. 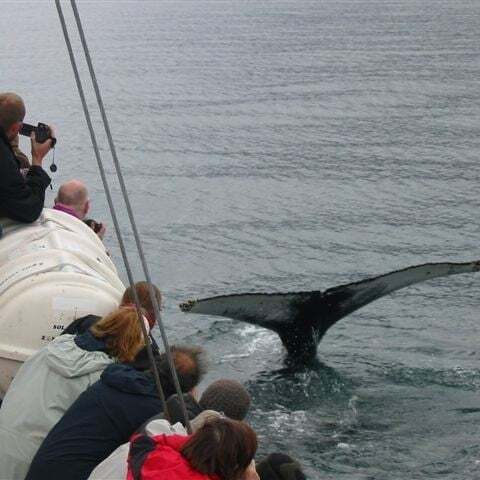 Svalbarðseyri is one of the best locations in Eyjafjörður for spotting and watching such visitors. 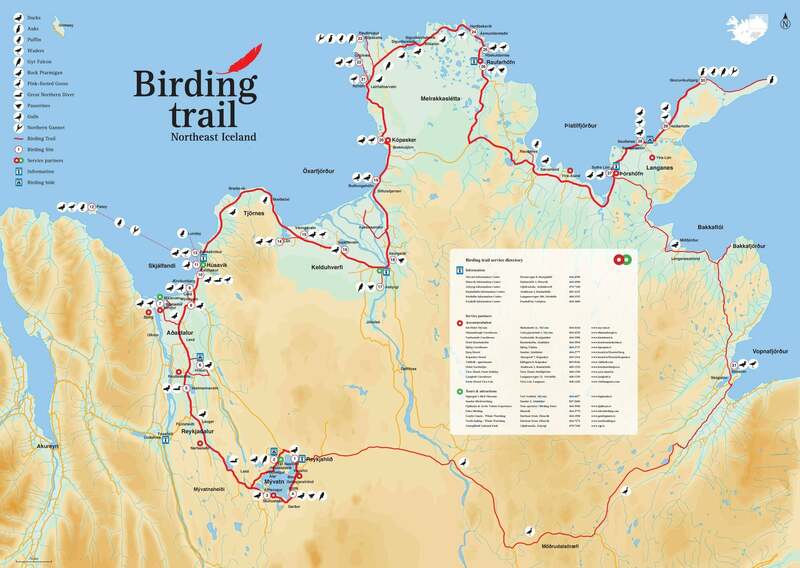 With this map we will guide you along the Birding trail through Northeast Iceland, from lake Mývatn to Langanes peninsula. Although we start at lake Mývatn you can of course join the trail anywhere along the route. It should take between 3 and 7 days to cover the bird trail, depending on the level of interest and your time frame. Covering the entire trail is well worth it in terms of the variety of both the birdlife and the landscape. The best time for birdwatching in the area is from mid May to mid June. Most of the breeding birds can still be found in the area in July, although many are more secretive by then. This text focuses on birdwatching in the months of May through July. The area’s specialities, such as Barrow’s Goldeneye, Harlequin Duck, Gyr Falcon and Rock Ptarmigan, are found in the area all year round and can be even easier to observe in winter than summer. Up to 80 species of birds can be seen along the trail, depending on the season and the time spent searching for birds. The text describes the trail with reference to the Birdtrail map. It includes 31 numbered sites which are considered to be the most interesting places to stop. The text also mentions sites between the numbered sites where a stop is likely to be rewarding. However, interesting birds can turn up almost anywhere on this route. The text focuses on where to find the scarcer birds; some common species are hardly mentioned as they are very easy to find in many areas. The roads along this trail are mostly paved, but there are still gravel roads at Melrakkaslétta, Langanes and Bakkaflói. A general 2WD vehicle should be sufficient to drive the trail, even though a 4WD vehicle is recommended for the seabird cliffs at Langanes. A telescope is always useful when birdwatching in Iceland, but binoculars will suffice in most places. 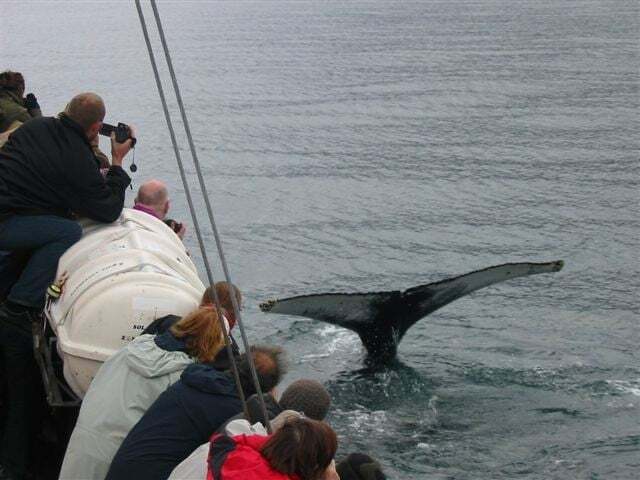 Wildlife in North Iceland combines birds, sea mammals and land mammals. In North Iceland you can expect to see over 80 species of birds, 23 species of cetacean and 7 land mammals plus a Polar Bear now and then. 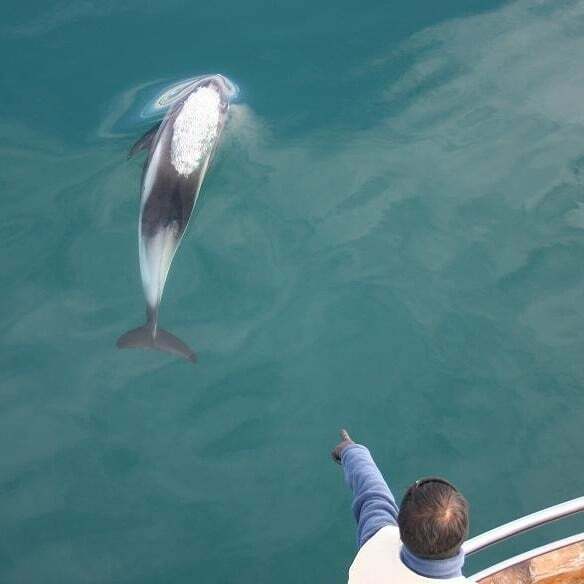 Some of the species you can expect to sea are the largest animal on earth, the Blue Whale, Grey Seal, Arctic Fox, Puffins, Gyr Falcon, Barrow’s Goldeneye to name a few. The rich bird life of the North, distributed over widely varying habitats, displays a diversity seldom surpassed in Iceland. Wetlands are important as a habitat for many Icelandic breeding species, and of the Icelandic wetlands which are famed for rich bird life, several of the most renowned are in North Iceland. Mývatn lake and the nearby Laxá river are home to more duck species than any other place in the world, while examples of other wetlands include Svarfaðardalur and the islets at the mouth of Eyjafjarðará. 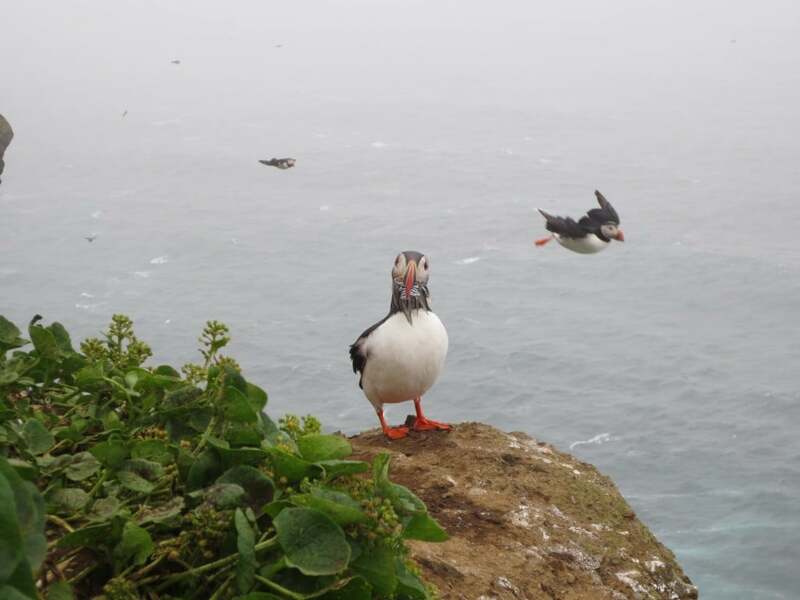 Some well-known bird cliffs are located in the North, such as at Grímsey, Rauðinúpur and Langanes, besides the islands of Lundey in Skjálfandi and Mánáreyjar just eastwards, with their large puffin colonies. Skoruvíkurbjarg is one of the best places in Iceland to see Guillemots at nesting site and the best place to see the Northern Gannet. 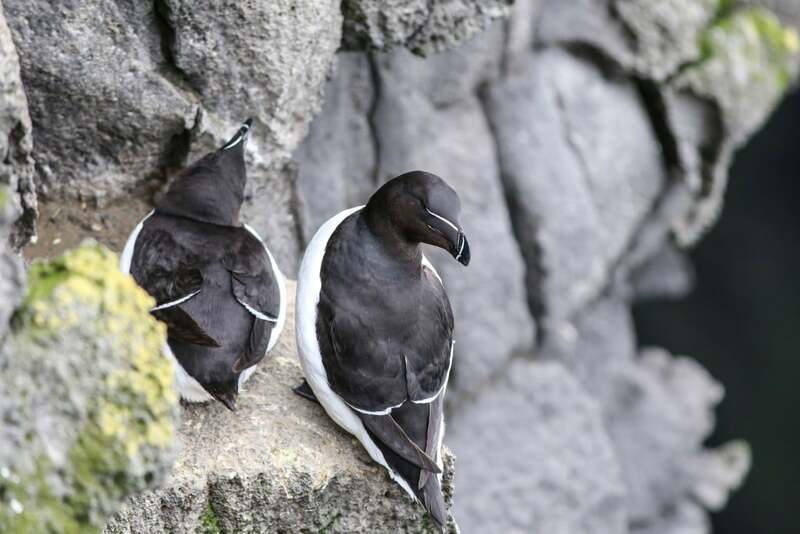 The cliffs at Langanes hosts hundreds of thousands of the auks and guillemots of Iceland, including the uncommon Brunnich’s Guillemot. The seaward end of the peninsula off which these islands lie, Tjörnes, has abundant puffins at points where it is easy to approach and observe them. Many cooperative project are in North Iceland regarding Birds and Wildlife. To explore seals the Icelandic Seal museum is where you would go www.selasetur.is/en and there is a project in progress to map birds and possible locations in the region so this is a newcomer that we look forward to exploring. To explore birds we have numerous options among of those are www.birdingtrail.is where you can both learn a lot about the Icelandic bird scene and get good guidance. 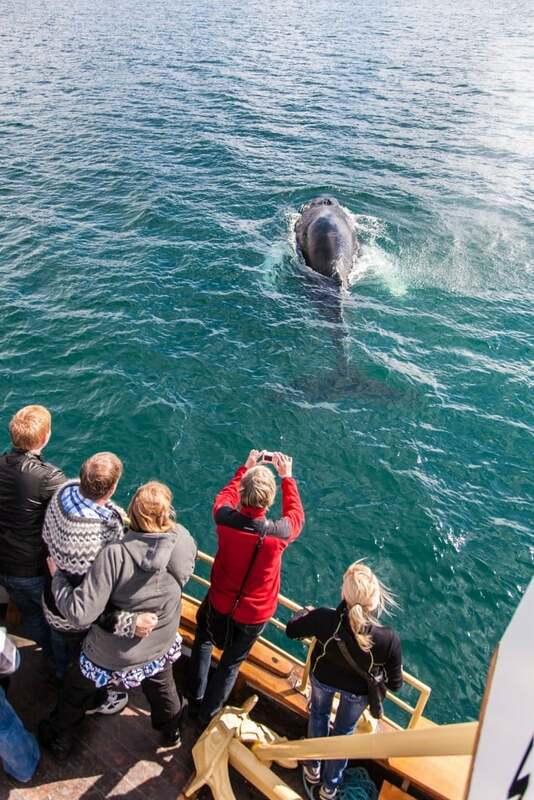 Watching whales has become one of the most common activities among foreign visitors to North Iceland. 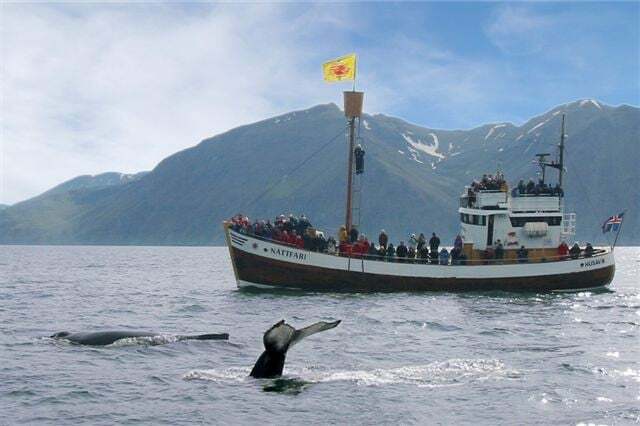 In fact, Húsavík and Eyjafjörður were among the first places in the country as a whole that offered whale-watching excursions. 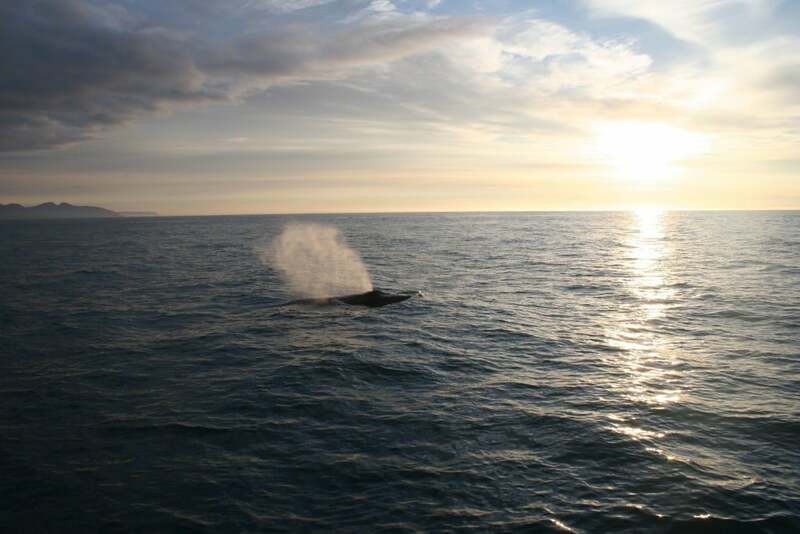 The number of species, along with favourable weather and sea conditions, make North Iceland one of the best Icelandic areas for spotting whales. Skjálfandi and Eyjafjörður are sheltered bays, perfect for a boat ride on a summer's day, surrounded by birds and beautiful scenery. 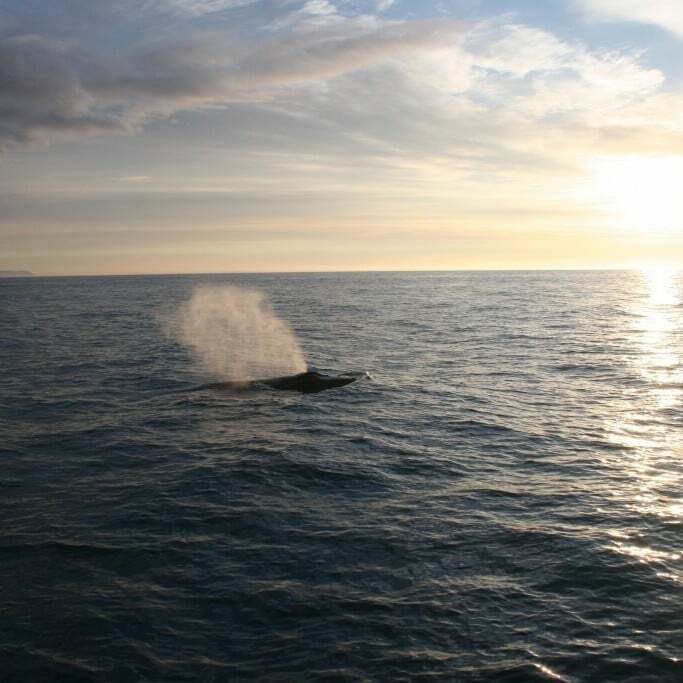 The experience becomes complete by seeing dolphins and minke, humpback or even blue whales play beside one of the particularly appealing oakwood boats used exclusively in North Iceland. 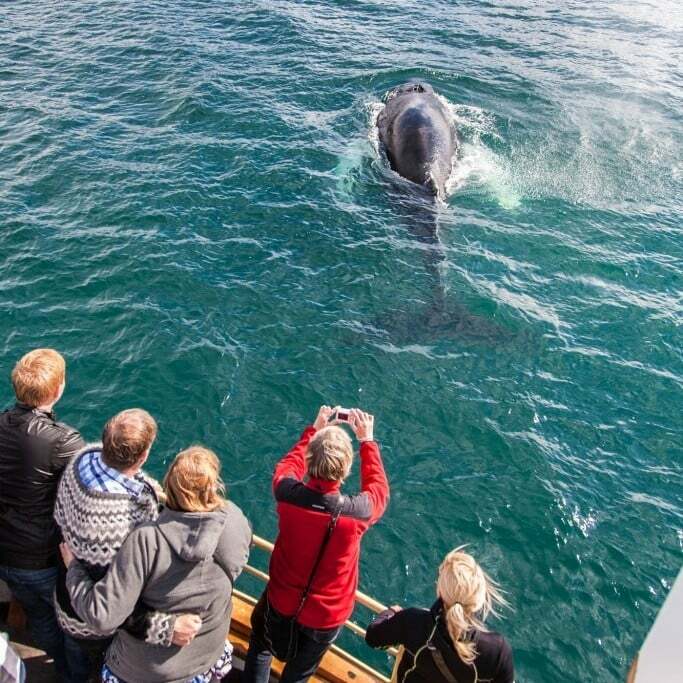 Watching a whale off North Iceland will fascinate anyone. Seals are incredibly beautiful and entertaining creatures and they are also said to be quite curious. Seal watching is a wonderful activity for the entire family. The harbour seal (Phoca vitulina) and the grey seal (Halichoerus grypus) are the only species to pup around Iceland, 4 other visit the island on a regular basis. Those species are harp seal (Phoca groenlandica), bearded seal (Erignathus barbatus), hooded seal (Cystophora cristata) og ringed seal (Phoca hispida). Walruses have also been found around Iceland but they are very rare. The Icelandic Seal Center created and runds the multi-national project The Wild North which aims to research the effects of tourism on wildlife in the North Atlantic region and produce a set of guidelines and advice for both tourism operators, the grneral public and local and national goverenment authorities. In 2011 a trail code of conduct was created for the watching of seals on the Vtansnes peninsula. The code of conduct can be found by clicking here. See www.birdingiceland.is for more info.